This post examines another excellent in-depth investigation by Reuters into global financial stability issues, and the role of tax havens in this giant game of pain and plunder. The investigation uncovers, among other things, a whole lot of offshore shenanigans, complementing what we (and relatively few others) have been saying for some years now, and it goes right to the heart of what capitalism is — or at least what it has become. Before reading this, though, see the box “What is a tax haven?” There’s a lot of misunderstanding out there. Deep offshoreThe term ‘tax haven’ is a bit of a misnomer: they aren’t just about tax. We will mostly use the term ‘offshore’ here instead of ‘tax haven’ – what we are talking about is the same basic phenomenon: jurisdictions offering escape routes to financial players elsewhere, helping them avoid taxes or disclosure or financial regulation or whatever other ‘burdens’ of society they don’t like. Whatever one might think of Congresswoman Maloney, that statement is spot on. U.S. banks moved billions of dollars in trades beyond Washington’s reach. “[The] FASB, the private group that sets accounting standards for public companies, came under political pressure to tighten rules blamed for exacerbating the financial crisis. Critics said FASB had made it too easy for banks to stash mountains of securitized loans in off-balance-sheet vehicles based in the Cayman Islands, hiding their exposure to risks that eventually swamped them and the global economy.
. . . as the Reuters graphic here suggests. 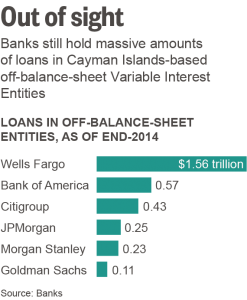 The banks, Reuters reports, hold nearly $3.3 trillion of securitized loans in off-balance-sheet entities. 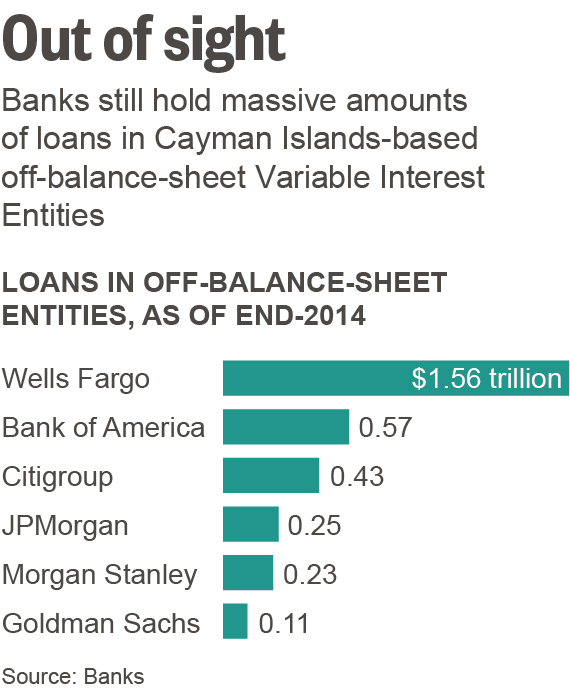 And that’s just Cayman and six U.S. banks. AIG had been hit by its financial products unit in London while Citigroup had been harmed by special purpose investment vehicles set up in the UK capital. “So often it comes right back here, crashing to our shores … if the American taxpayer bails out JPMorgan, they’d be bailing out that London entity as well,” he told the House financial services committee. Back to Reuters. The story trawls through a lot of colourful detail, including the work of an activist JP Morgan Vice President known as “Loophole Leslie” Seidman, as well as a number of regulatory changes after the Dodd-Frank financial reform bill which were “all in the direction of watering it down,” according to Marcus Stanley of Americans for Financial Reform. This Reuters investigation is a reminder of how much important stuff has been going on behind the scenes. They are relying on the fact that nearly everyone is tired of this stuff now. Which, again, is offshore: our terrain. “The lobbying blitz helped win a ruling from the CFTC that left U.S. banks’ overseas operations largely outside the jurisdiction of U.S. regulators. In case anyone were crazy enough to think that this stuff has stopped, the indefatigable Americans for Financial Reform a few days ago came out with news of this latest godawful exemption. Cayman again. LTCM was a biggy – causing global market carnage at the time. However, the only book today’s blogger has read about it – Roger Lowenstein’s otherwise excellent When Genius Failed — does not mention Cayman once in the footnotes. You will hardly find it mentioned here or in other detailed analyses. This wasn’t on anyone’s radar screens at all. And far too few people are paying attention to the financial stability threats that lie offshore, hidden and unknown until crisis hits. Now this isn’t to say that the next crisis won’t be triggered and significantly caused by an economic collapse in China, or an asteroid strike, or something. But the last big crisis showed — if you look carefully — how tightly connected all this stuff is, and how offshore is so often at the heart of it. 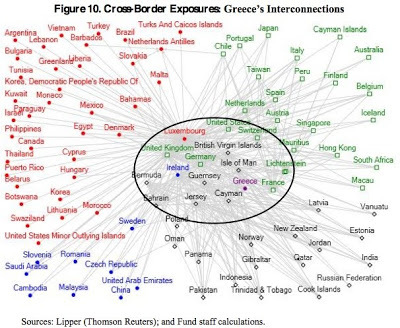 This IMF graph from 2010 is one of the only bits of research that really points the finger offshore. (Even then, though, they pussyfoot around using such emotive words such as ‘tax haven’ or ‘offshore.’) But just look at that rogues gallery in the cross hairs: BVI, UK, Luxembourg, Ireland, Bermuda, Cayman, Jersey, Isle of Man, Switzerland, Liechtenstein. And of course the United States. As mentioned, this stuff goes to the heart of what capitalism has become. All this regulatory arbitrage, like tax cheating and so much other stuff that is going on, is a form of what academics call rent-seeking, and we prefer to call ‘wealth extraction.’ In this case, it’s ultimately about extracting wealth by gambling with other people’s money: taking risks and getting others to pay when the balloon goes up. The more risks build up, out of sight and offshore, the more likely they are ultimately to create mayhem. Hence the headline of this post. The world’s leaders and international financial institutions need to wake up to what offshore is, and where it is. The place to start looking is London.